Common Plantain is a perennial with leafless stalks, which can grow up to 30 cm. in height. 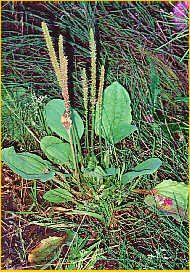 Common Plantain grows from fibrous roots. - ripe seed heads can be used for bird food. - Common Plantain is often called 'soldier's herb' because it has been used over the centuries to treat wounds on the battle fields. - as the Roman legions did when they marched across continents, hikers today can place the leaves in their boots to reduce the effects of blisters and pain. - Common Plantain leaves can be chewed and the juices mixed with saliva to be spread on abrasions, burns or bee stings. - Plantain is a common ingredient in a poultice or salve.